I had previously being using Micellar water for every day eye makeup removal, whilst effective at removing the large bulk of product I found that I needed to dig in and go over it a few times to fully remove mascara and liners. Micellar was not effective on gel or liquid liners so I moved on to alternating with The Balm Cosmetics Balms Away Eye Makeup Remover, a solid oil based cleanser which literally melted the makeup away! Balms Away is wonderful for heavy makeup days but too heavy for every day use. I then tried samples of Clinique Take The Day Off and Clarins Instant Eye Makeup Remover. Samples are great for testing out more expensive products. Both had a more effective cleanse than Micellar however I still had to dig in and occasionally noticed a stinging sensation if I was tired and my skin was sensitive. Not good! 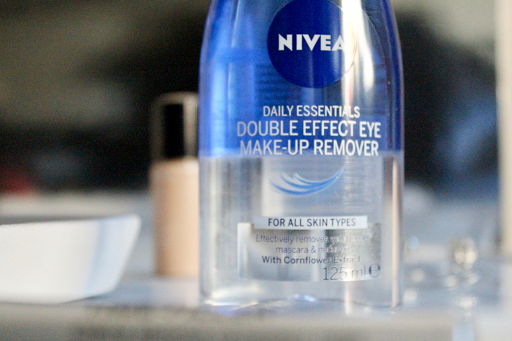 Then my mum gave me a bottle of Nivea Double Effect Eye Make-Up Remover for Christmas. I was hesitant at first. My skin has never agreed with Nivea in the past and I have found that they can be too harsh leaving me quite raw. 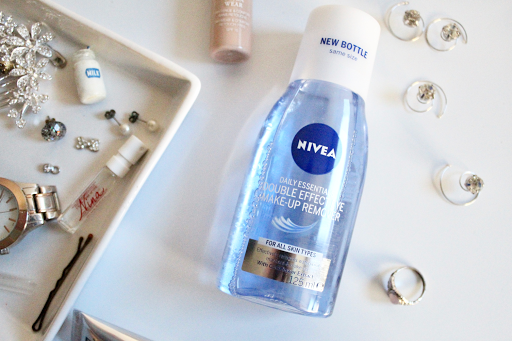 Putting a Nivea product near my eyes seemed like a risky gamble but I gave it a go anyway and was pleasantly surprised! There was no need to dig in when removing heavy eyeliner and absolutely no stinging, even at my most tired. The two immiscible liquids emulsify (HIYA GCSE SCIENCE LINGO) when shaken. You shake it all up, soak a cotton pad and then you get the deep oil cleanse along with the "touch clean" feeling of a water based product. I was left with a soft and nourished feeling skin rather than dry and raw. No redness here! So I stand before Nivea (figuratively) with my hat in hand and apologise for completely writing off their brand as a whole. It really does go to show that you have to try new things and that there is always something out there that will work for you. Oh and you really do need to use eye make-up remover. Sorry.